A friend of mine went to the Plant Delights Nursery in Raleigh this weekend and helped me out by picking up some roses for my soon-to-be garden border out back. She knows I love old garden roses the best so she picked up Rose de Rescht, Blush Noisette, and Souvenir de la Malmaison. They will soon join the hydrangea, the cherry bush, and the lilac by the back fence. Boy do I have a lot of grass to get rid of! The bushes will all be spaced eight feet apart and the spaces between them will be filled in with whatever strikes my fancy. I will be looking for a hardy lavender, some rosemary, a bunch of bulbs/tubers (gladiola, iris, tulip, lilly, daffodil, grape hyacinth), salvia, garlic, alium, daisies, coreopsis, monarda, thyme, dianthus, and gosh, just whatever isn’t a dandelion, chickweed, crabgrass, or some kind of thistle, which is what grows there now. I can picture what I want, but not how to describe it. Maybe like a cottage garden – only not as messy. I’m a bad gardener in that I did not prepare beds at all. I just plopped the bushes in the ground and left all the grass and weeds in and around there. It’s going to make my life a lot harder now to get the border in, but it seemed preferable to leaving the plants in pots to die of dehydration like I have every other year. This is a long term project anyway. It’s not like I’m going to have a picture-perfect border by the end of the summer. There’s a lot of work to do, and I hate digging, being dirty, and heat. But I like flowers, so there’s that. Just call me a reluctant gardener. The good news is that the front yard looks pretty good. We have a service do the lawn treatments up front so it’s pretty much all nice, green grass. The front landscape beds are starting to shape up too. 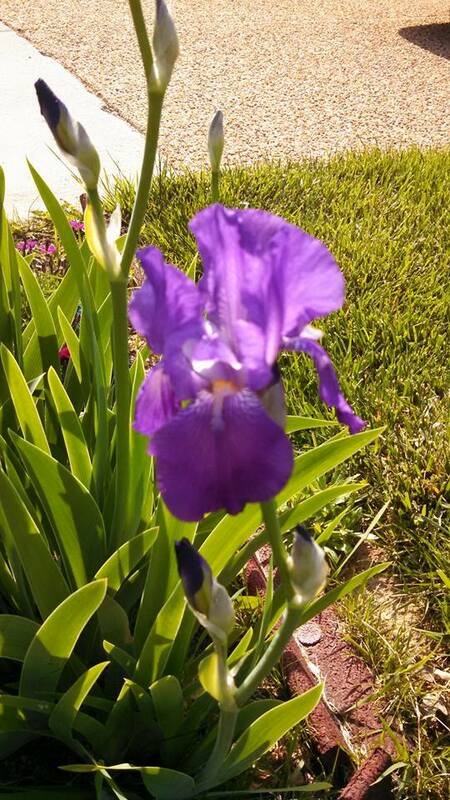 Mom’s irises bloomed this year and look nice with the clematis and other plants already in there. The heirloom peony has about 30 blooms on it waiting to burst open. The new peony just got transplanted so it’s a bit small with no buds, but it’s alive and we may get flowers on it next year. The lilies seem to be settling in, and the knockout rose is well, a knockout. Once I get bulbs bought and planted this fall, the front yard should start really coming into its own.